Summary: This PhD topic is about the development of new multi-robot perception methods for heterogeneous robots (ground and aerial) carrying different sensors (e.g., laser-based and vision-based). The robots need to communicate and coordinate themselves using an efficient multi-robot software architecture. The robots have to collaborate together in order to ensure the recording of essential data (e.g., visual/3D) concerning a given phenomenon happening in the environment. The coordination has to consider the specific perception strengths and limitations of each different robotic unit. The ensemble of the recorded data must be rich enough to allow a full reconstruction and analysis of the phenomenon. The developed methods must be general enough to be applied to several different scenarios, which can be described during the interview for the retained candidates. The PhD student will have not only to develop the theoretical methods but also implement them on the robots in an efficient and reliable way. A possible collaboration with the UZH/ETH-Zurich and CTU-Prague is envisaged for the hired PhD student. Summary: This PhD topic is about the development of new methods for controlling multiple heterogeneous robots (ground and aerial). The objective of the control will range from coordinated motion to coordinated co-manipulation of large objects. The robots need to communicate using wireless communication and coordinate themselves using an efficient multi-robot software architecture. The robots have to collaborate together in order to ensure the high performance execution of the task. The focus is on studing general methods that can enable highly dynamic tasks, in which the actuation, communication and sensing constraints of the robots play a crucial role. A possible envisaged way is the use of distributed model-predictive control strategies. The developed methods must be general enough to be applied to several different scenarios, which can be described during the interview for the retained candidates. The PhD student will have not only to develop the theoretical methods but also implement them on the robots in an efficient and reliable way. A possible collaboration with the University of Padua and other leading institutions in the field in Europe is envisaged for the hired PhD student. Summary: This PhD topic is about the development of new models and methods using deep learning for the control of aerial robots in hard aerodynamic scenarios. More information will be given to retained candidates. The positions are fully funded according to the French national laws. PhD student and Postdoc positions in France are regular jobs with social benefits (e.g., a pension and unemployment plan). You will get access to excellent research facilities (motion capture, 3D printing, a large flying arena, electronic and machine workshops). Toulouse is the Europe's aerospace capital and is ranked among the first three cities in France for living, studying, and working (read, e.g., this article). We are in the robotics department of LAAS-CNRS, one of the largest laboratory of CNRS, the flagship (and largest) Center of Scientific Research in France. LAAS-CNRS was founded in 1968 and it counts around 700 people, with more than 100 tenured researchers. Research at LAAS-CNRS spans robotics, optimization, control, telecommunications, and nano-systems. The robotics department at LAAS-CNRS counts more than 100 people and is supposedly the largest and oldest robotic department in France (it was founded at the end of the 70's). 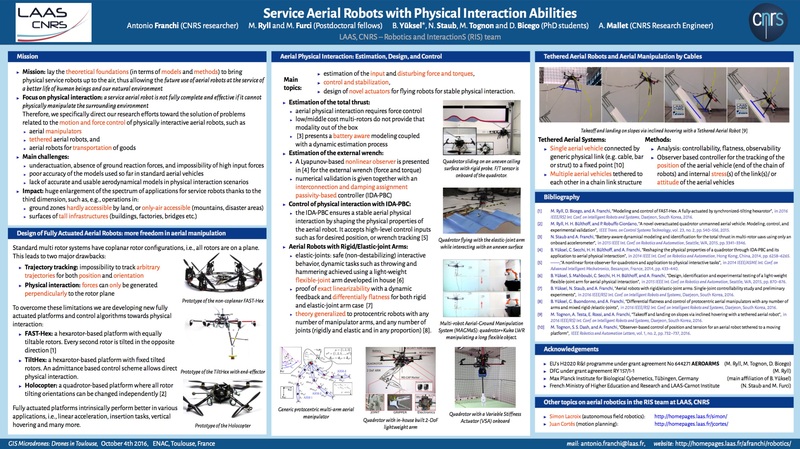 LAAS-CNRS has made world-class contributions in artificial intelligence, planning, perception, humanoids, and aerial robot design and control. Being enrolled in a master course on computer engineering/science, mechanical/aeronautical/electrical engineering, robotics, physics, or related fields. Good experience with Unix, Matlab, C/C++ or Python. Familiarity with tools such as ROS, OpenCV, Git, TensorFlow, Deep Learning frameworks, and GPU optimization skills. Applications sent directly by email and not through the web form will not be considered. I receive many applications and I cannot reply to all of them. In case of positive feedback, you will be contacted within 4 weeks from your application. If not positive, you won't hear back.